This is something that has been bugging o lot of people in Los Angeles and now seems to be a great time to let the Mayor hear your voice. 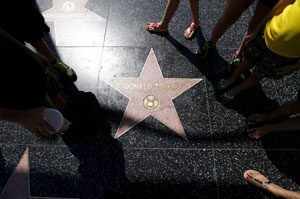 The marker has been pummeled by a pickax and a sledgehammer, but now the West Hollywood City Council has voted to remove President Trump’s star from the Hollywood Walk of Fame. The council will send a formal letter to Los Angeles Mayor Eric Garcetti, the Los Angeles City Council and the Hollywood Chamber of Commerce to consider removing it. But, according to a statement from the chamber, it’s unlikely it will act.